The 2016 action RPG finally lands on PC next week. I played over one hundred hours of Final Fantasy 15 on PS4, and I'm pleased it's coming to PC in what should be its best iteration yet. With a first-person mode, visual effects upgrades and modding support, its release feels like a real event, even if the wait has been longer than we'd have liked. You probably know what the game is at this point—a moving and often thrilling roadtrip adventure between Prince Noctis and his three friends. It's much more of an action game than Final Fantasy entries of the past, with noticeably lighter RPG elements, and its structure will feel familiar to anyone who has played an open world game from the last ten years. It's finally out on Steam next week, having originally arrived on consoles back in December 2016. "In previous Final Fantasy titles, we always completed work on the console versions and then started thinking about a PC port," says Takeshi Aramaki, technical director & lead programmer, when I ask how the process for bringing FFXV to PC compares to past entries (some of which took years to make the leap). "In Final Fantasy 15, we actually started development with a Windows edition in mind, and did everything in parallel." "We really wanted to be able to get this game out globally to as many countries as possible, and we understood that a number of different regions and countries are very much PC markets." "One of the things we really want to push about this game is that it's really not just a port of the console version," adds Kenichi Shida, game design and development manager. "It was reworked and redesigned from the ground up, pretty much, to appeal to a PC market and give them what they want." Given the recent explosion of Japanese console games coming to PC—including recent, excellent ports of Final Fantasy 10/10-2 and Final Fantasy 12—I ask if the developers think the PC market has changed in the past decade. "I think certainly from Square Enix's point of view, we've had some PC titles that have done quite well in the past ten years—online games like Final Fantasy XIV [for example]," Shida says. "But for our department which has only focused on console games before, having this environment now where a lot of people do port to PC is a big change, it's a big challenge for us to see this new status quo." At the PC Gamer Weekender earlier this month, I was surprised when they revealed the above first look at how mods can work in the Windows Edition, a moment that made many members of the packed crowd reach for their phones. Making mods a part of the way they publicise the game is an interesting approach. "It's very much to do with our overall roadmap for the game," Shida says. 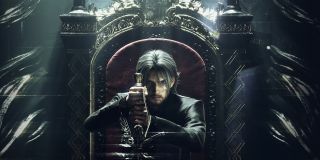 "Certainly, our director Mr Tabata, feels at this point in the game's evolution, it's finished doing everything he wanted to do initially for the game. Releasing the Windows Edition and the Royal Edition—that's everything we wanted to do from the start. And then obviously, because of that, we're at a turning point in where we see the evolution of the game. In a more general sense, we want people to be as free as possible and make they want to make. We don't want to limit people in what they make for this game at all. "From here, we want to give more freedom to the players to do what they want to do in the game, and evolve it in new ways we hadn't thought of. So that's where mods come in. When it comes to how we decided we were doing it, it wasn't that difficult a decision—the reason being that mod support is something that PC gamers look to and want so much, and so many other games do it, but it wasn't actually that difficult. We know they wanted it, and that we had to give it to them, basically." The potential clearly excites them. "In a more general sense, we want people to be as free as possible and make they want to make. We don't want to limit people in what they make for this game at all." Mods aside, a lot of Final Fantasy 15 Windows Edition's marketing has focused on how nice it'll look on the highest-end hardware. That side of things is exciting for people with super-expensive graphics cards, but I'm curious to know how much they considered lower-range players in optimising the game. "We very much wanted to cover a broad range of different users with different specs available, from people playing on their laptop who can't run any of the high-end stuff up to people who want 4K and to use all the Nvidia [settings] at once," says Aramaki. "It was important to make the game scale so it could work at any of those levels, really, and we've put a lot of effort into that. We did think of every kind of user when we designed it." The PC version's first-person mode is an intriguing addition, too. Considering how much Noctis moves around in combat, my immediate concern was feeling a bit woozy after two minutes of playing it in first-person. Aramaki explains how they addressed that. "We've been working on the first-person mode for quite a long time on the development team, and we really did understand the idea of not making the player disoriented and dizzy from all the movement, so we've done a lot of subtle changes to the camera and tweaking the angles and positioning of the camera when you're in the mode—not making it move around so much. One other example, of course, is when you're hit and take damage, reducing the camera shake there so it doesn't always feel like you're wobbling. All those little changes add in to reduce that feeling of disorientation." When Square Enix announced the PC version of FF15, I assumed that it'd mark the end of the game's journey on all formats, which has seen four expansions added to the console version after release, among multiple updates (all of which will be included in the PC edition). But that's not the case. "We very do think of 15 as an active game, as it were, and we were thinking of lots of different things to expand and keep people playing," Shida says. "It's still going to go on." It's been confirmed that Final Fantasy 15 will get four more DLC episodes through to 2019, at which point the game will be over two years old. According to Shida, the game's active audience is still growing—and an influx of PC players can only help. "When we released the Episode Ignis DLC and the Comrades DLC, that active userbase was still growing even then. With the recent Windows Edition, it's just going to push it further. So we have a massive audience now, and we want to keep giving those people new stuff." I can't say I was terribly fond of the extra episodes when they were released on consoles, as they focused on the core cast in stories that felt a little inconsequential, but it's pleasing that Final Fantasy 15's journey isn't over yet after it comes to PC. Other past updates to the game have focused on filling in parts of the story, or adding fun, free limited time events. These just give players reasons to keep coming back. At the end of the interview, Shida asks me what I think will keep people playing on PC, and I tell him that anything Square Enix can do to support and encourage modders is a positive thing to me. An official mod tool is in the works. If a community can grow for years and years around FF15, and we can constantly write about the cool stuff people are making like we do with Fallout and Skyrim, that'd be so exciting. Turning civilians into cactuars is a good start, though.